Endometriosis is an estrogen-dependent gynecologic disease, characterized by the presence and growth of endometrium outside the uterine cavity. This pathology affects about 10 % of reproductive-age women and is associated with infertility, chronic pelvic pain, dysmenorrhea, and dyspareunia [1-4]. The etiology of this disease remains incompletely understood . Retrograde menstruation with viable endometrial fragments has been advocated as one of the mechanisms by which the endometrium reaches the peritoneal cavity . However, this theory fails to explain why only a select group of women experiencing retrograde menstruation develops endometriosis . Endometrial estrogenic microenvironment has been shown to be an important factor in the pathophysiology of endometriosis by abnormal expression of enzymes involved in estrogen synthesis and degradation [8, 9]. The activation of CYP19A1 gene induces P450Arom expression, the rate-limiting enzyme in conversion of androgens to estrogens. Normally, steroid factor-1 (SF-1) positively regulates the CYP19A1 gene in the ovary, though not in the normal endometrium. Nevertheless, SF-1, expressed in eutopic and ectopic endometria from women with endometriosis, aberrantly activates CYP19A1 and the expression of P450Arom in stroma [10-12] or gland [13, 14] in these tissues as has been extensively described favoring this estrogenic microenvironment in this disease. SF-1 gene is recognized in a region called E-box by upstream stimulatory factor (USF), the ubiquitous transcription factor involved on embryonic development, fertility, stress, growth and lipid and carbohydrate metabolisms [15, 16]. Although two types of USF, USF1 and USF2, have been reported, it is USF2 that shows the highest binding activity on SF-1 promoter and its knockdown results in down-regulation of SF-1 and also of its target gene CYP19A1 in ectopic endometrium from endome-triosis women . Two variants of USF2, produced by alternative splicing, have been reported, the bigger USF2a (44 kDa) and the smaller USF2b (38 kDa) by the loss of 67 internal amino acid in the N-terminal domain [15, 18]. Estradiol (E2) acts through the classic nuclear estrogen receptors (ER), ERα and ERβ, both strictly regulated by the ovarian steroid hormones during the menstrual cycle, with a predominance of ERα over ERβ in the normal endometrium and reducing their expression during the secretory phase [19-22]. In eutopic endometrium from women with endometriosis, although each ER isoforms are increased, the ERα/ERβ ratio is decreased affecting the normal actions of E2 in this tissue [23, 24]. In addition, a membrane receptor called G-protein estrogen receptor 1 (GPER1) presents high affinity for E2 in vitro [25, 26] and has been described as potentially responsible of early and non genomic responses of estrogen in sevERαl cell lines and tissues including the endometrium [27-29]. The aberrant expression of CYP19A1 and SF-1 genes in eutopic and ectopic endometria of women with endome-triosis led us to study USF2 variants protein contents in human endometrium throughout the menstrual cycle and the effect of estrogenic and proinflammatory environments in epithelial cells of eutopic endometrium from women with and without endometriosis. The involvement of nuclear ERα, ERβ or GPER1 in the E2 action on USF2 variants, SF-1 and P450Arom protein expression was also evaluated. The protein content of both USF2a and USF2b variants were detected by immunoblot (Fig. 1) in endometrium from women with endometriosis and controls. No intERαctions between USF2 protein studies and subject age was found by ANCOVA. Two protein bands (44 and 38 kDa), corresponding to USF2a and USF2b variants, respectively, were found in the nuclear compartment of control and endometrio-sis endometria (Fig. 1). In control endometria, nuclear USF2a protein content decreased in early and late secretory phases (37 and 57 %, respectively, p < 0.05) as compared to the prolifERαtive phase. On the other hand, in endometriosis, USF2a contents were lower during the late secretory as compared to the mid secretory phase, although higher than late control endometria (Fig. 1a). 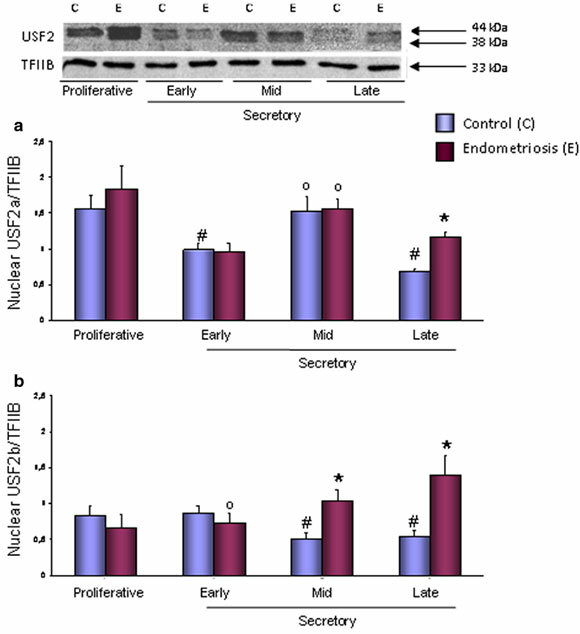 During mid and late secretory phases, USF2b (38 kDa) nuclear protein content significantly decreased (39 and 34 %, respectively) as compared to prolifERαtive phase in control endometria, instead it was observed an increase in endometriosis endometria during the same stages of the menstrual cycle, being higher 100 and 155 %, respectively, than control (Fig. 1b). 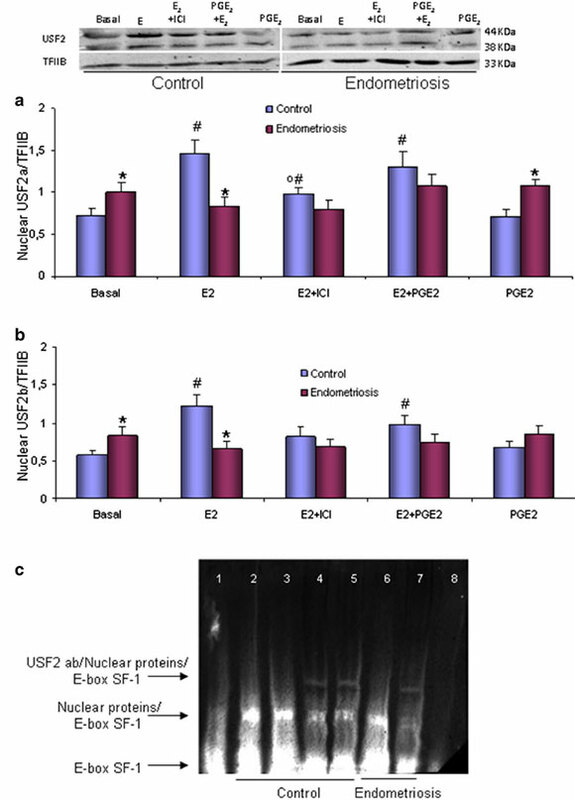 In endometriosis epithelial cells, nuclear protein contents of USF2a and USF2b were significantly higher in basal condition than control cells. Nevertheless, only in control cells, E2 increased USF2a (103 %) and USF2b (91 %) nuclear protein contents, effect also partially blocked by the presence of ICI (Fig. 2a, b). Nuclear protein homogenate obtained from control and endometriosis epithelial cells bound to target E-Box motif, complexes displaced by cold probe. The previous incubation of the nuclear protein homogen-ates with USF2 antibody shifted partially the protein/E-Box complex in basal or E2-treated conditions (Fig. 2c). We observed a null effect on USF2a and USF2b nuclear protein contents of 10-8 mol/L PGE2, in the presence or absence of 10-8 mol/L E2 in isolated epithelial cells from both control and endometriosis endometria (Fig. 2a, b). 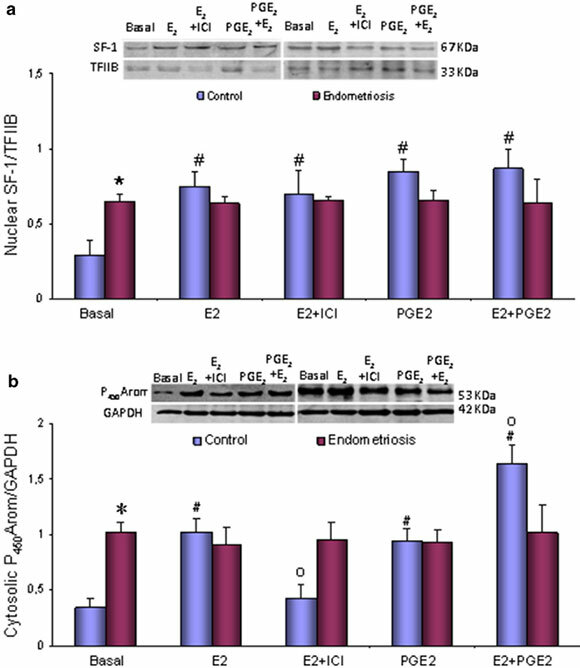 Epithelial cells obtained from endometriosis endome-tria had high SF-1 protein expression in basal condition, which were resistant to E2 and PGE2 (Fig. 3a). On the contrary, in control epithelial cells, the SF-1 protein content was strongly increased by E2 (126 %) as compared to basal, effect not modified by the presence of ICI. The presence of PGE2 also increased the content of SF-1 protein (154 %) as compared to basal, although no additive or synergistic effects were observed when E2 and PGE2 were added together (Fig. 3a). Similarly to SF-1 protein results, the cytosolic protein content of P450Arom was strongly high in epithelial cells from endometriosis endometria in basal condition, and also resistant to E2 and PGE2 presences (Fig. 3b). In control epithelial cells, P450Arom protein content was significantly increased by E2 (292 %), effect partially blocked by ICI pre-treatment. PGE2 increased (258 %) the protein content of P450Arom and the presence of both, E2 and PGE2, shows an additive effect (525 %) on the protein content (Fig. 3b). Taking into account that cells obtained from endometrio-sis women are highly endogenously stimulated, control epithelial cells were used for the following experiments to assess the ER isoform involvement. 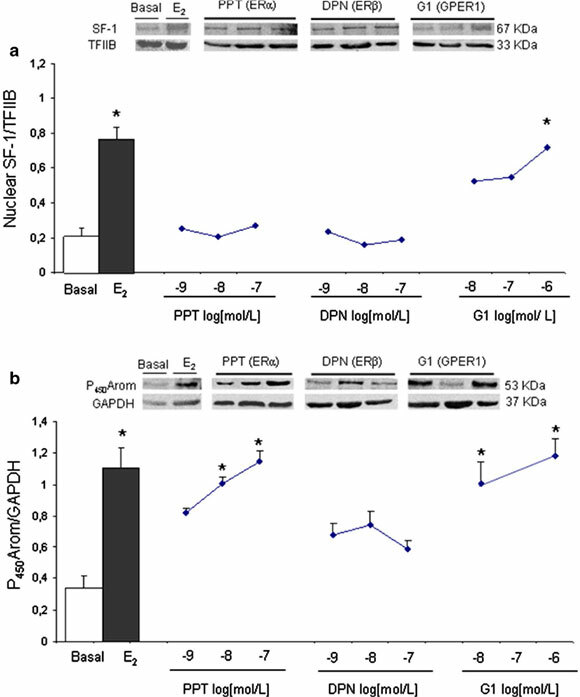 For that, control cells were incubated with specific agonists for ERα (PPT), ERβ (DPN) and GPER1 (G1). These cells responded to PPT at 10-7 mol/L and G1 at 10-6 mol/L, increasing the protein content of USF2a by 153 and 164 % and USF2b by 169 and 109 %, respectively (p < 0.05). The stimulatory effect of PPT was blocked by the presence of ICI. Paradoxically, ICI alone increased both USF2 variants. 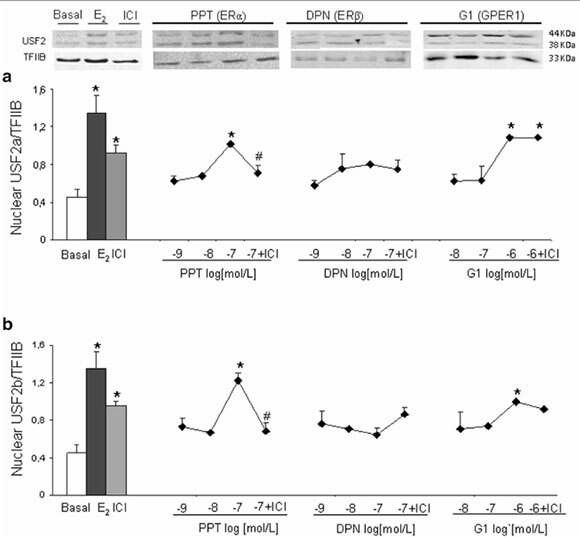 No significant effect was observed with DPN (Fig. 4a, b). Only G1 increased SF-1 nuclear protein content by 250 % at 10-6 mol/L in the control cells (Fig. 5a). Similarly to SF-1, P450Arom cytosolic protein content was increased in a dose-dependent manner by G1 (242 %) and also by PPT (232 %) as compared to basal condition (Fig. 5b). To our knowledge, this is the first report on human endometrial USF2a and USF2b protein co-expression throughout the menstrual cycle, and their positive regulation by E2 through ERα and GPER1. We observed a strong E2-stimulatory effect on USF2 variants nuclear protein contents in epithelial cells from control endometria. These findings are supported by the epithelial cells response to ICI, an antagonist of ERα and ERβ, which partially blocked those effects induced by E2, but completely blocked those induced by PPT (specific agonist of ERα) and acting as agonist for GPER1, unaffected those effects induced by G1 (specific agonist of GPER1), confirming the dual action of ICI on estrogen receptors . These data suggest that this process is under ovarian steroid regulation through the classic nuclear ERα and also GPER1. Interestingly, positive regulation of the ERα expression by USF2 has been reported in sheep uterine arteries [32, 38] showing a complex relationship between both transcription factors. The action of E2 through GPER1 not only may be involved on the USF2 protein synthesis or viability, but also on the USF2 activation through sevERαl pathways described for GPER1 [25, 39-41]. This aspect is of high relevance considering the important role, beside the cell-specificity, that specific phosphorylation plays on the activation of USF protein that modifies its function from tumor suppressor in prostate cancer to tumor promoter in lung cancer and thyroid cancer as recently Horbach et al. reported [15, 42]. Our first hypothesis was that the strong increase of USF2 induced by E2 might stimulate the SF-1 transcription activating the E-box motif, which in turn may induce Cyp19A1 gene increasing the key enzyme P450Arom. However, the discordance between the high USF2 protein expression and the weak binding observed on SF-1 E-Box DNA consensus studies suggests a partial effect of USF2 on SF-1 gene promoter in cell treated with E2. Nevertheless, more studies are needed to confirm or to discard this pathway. Furthermore, the proinflammatory environment, genERαted by PGE2, was unable to modify USF2 variants protein, although induced a strong stimulation on SF-1 and P450Arom protein contents, indicating different regulations. The up-regulation of P450Arom by PGE2 through cAMP/CREB signaling pathway was previously reported [1, 11, 12, 43]. The additive effect of E2 and PGE2 on P450Arom protein contents indicates different activation mechanisms. Similar additive effect we reported previously in isolated control epithelial cells treated with peritoneal fluid from endometriosis women (PF-E) and Bu2cAMP  mimicking the conditions of the endo-metriotic lesions. In our control epithelial cell model, P450Arom stimulation by E2 was through ERα and GPER1, but not through ERβ as it was previously proposed [1, 45] probably by the use of isolated control epithelial cells and not endometriotic stromal cells. It is known the important role of SF-1 on steroid hormone biosynthesis, and also on development, differentiation, and function of the endocrine tissues . The non-classic receptor GPER1 mediating the E2 stimulatory action on SF-1 protein content as shown by our G1 data, is in agreement with SF-1 activation and endometrial cell prolifERαtion through the PI3K and MAPK pathways activated in sevERαl cell lines transfected with GPER1 [39, 40]. However, cAMP pathway cannot be ruled out according to similar response to (Bu)2cAMP of control or SF-1-transfected endometrial epithelial cells as we previously reported . In the present study, control epithelial cells were sensitive to E2 and/or PGE2 treatments, mimicking the estrogenic and pro-inflammatory microenvironment described in endometriosis, inducing abnormal molecule expression similarly to endometria from women with endometriosis as has been widely reported by sevERαl authors including our own group [14, 33-36, 47]. Very little information are regarding USF2, and even less about USF2 variants. Our data of sustained USF2 protein expression during the secretory phase in eutopic endo-metria of women with endometriosis, an invasive estrogen-dependent disease, and the fact that the USF2 action is cell specific and may change its function from tumor suppressor to tumor promoter with invasive characteristics [15, 42], suggest that USF2 may be involved in the pathophysiology of the endometriosis. To our knowledge, this is the first report that shows USF2 variants protein expression patterns in human normal and pathologic endometria during the menstrual cycle and its E2 stimulation mediated by ERα and GPER1 visualized by the response of cells obtained from control endometria, being unaffected the endogenously stimulated cells from endometriosis origin. The lack of E2 stimulation on USF2/SF-1 E-Box/DNA-sequence binding and the absence of PGE2 effect on USF2 variants opposite to the strong induction that they exert on SF1 and P450 proteins suggest different mechanisms and regulations. The sustained USF2 protein expression during the secretory phase in eutopic endometria of women with endometriosis may participate in the pathophysiology of this disease strongly associated with infertility and its characteristic endometrial invasion to ectopic sites in the pelvic cavity. Eutopic endometrium was obtained from 37 women undergoing diagnostic laparoscopy for endometriosis associated with pain and/or infertility (endometriosis group), and 49 women without endometriosis undergoing laparoscopy for tubal ligation or hysterectomy for a benign non-endometrial gynecologic condition (control group) in the Clinical Hospital San Borja-Arriarán. The age of these women was 33.9 ± 5.6 years for the endometriosis group and 36.7 ± 6.5 years for the control group (p < 0.05). Both groups of women had abstained from any hormonal treatment for at least 3 months prior to surgery. Endometrial biopsies were obtained during surgery with Cornier pipelle suction curettage from the corpus of the uterus, kept in cold sterile phosphate buffer saline (PBS), and transported to the laboratory at 4 °C. One piece of the tissue was fixed in formalin for histological evaluation, others pieces were frozen for protein studies or used for endometrial epithelial cells isolation. The endometriosis grade was 49 % minimal-mild (score 1-15 points) and 51 % modERαte-severe (score > 16 points) according to American Society of Reproductive Medicine criteria . Endometriosis was diagnosed during surgery by visual evaluation by an experimented surgeon in each patient. This study was approved by the ethical committees of Faculty of Medicine of University of Chile and Metropolitan Central Health Service of Chile; each patient signed a written informed consent before surgery. Endometrial samples were dated according to Noyes criteria  and classified as prolifERαtive (days 6-14; 12 control and 9 endometriosis samples) phase or early (days 15-18; 12 control and 10 endometriosis), mid (days 19-23; 12 control and 10 endometriosis), and late secretory phase (days 24-28; 13 control and 8 endometriosis). Secretory endometrium was washed in PBS, minced, and digested according to previous indication . The glands were separated and cultured according to previous indication [44, 50] and after the first or second passage, the cells were reseeded in duplicate protein studies until sub-confluence. Then, the cells were incubated in fetal bovine serum-free medium (defined-medium) for 24 h, and treated for another 24 h in fresh defined-medium without (basal) or with prostaglandin E2 (PGE2, 10-8 mol/L; Sigma), or E2 (10-8 mol/L; Sigma). Increasing concentrations of Propylpyrazole-triol (PPT, 10-9 to 10-7 mol/L, Tocris Bioscience, Bristol, UK) and Diarylpropionitrile (DPN, 10-9 to 10-7 mol/L, Tocris), specific agonists of ERα and ERβ, respectively, or G1 (10-8 to 10-6 mol/L, Merck KGaA, Darmstadt, Germany) specific agonist of GPER1, were also added to cell cultures for 24 h in the presence or absence of ICI-182,780 (10-6 mol/L, ERα and ERβ antagonist; Tocris) added 40 min before of ER agonists. Cytosolic and nuclear proteins from endometrial pieces and epithelial cells were obtained as previously reported . The protein concentration was determined using the Bradford Assay reagent (BioRad, Hercules, CA, USA). Thirty μg of cytosolic and nuclear proteins were denatured, resolved in 10 % PAGE-SDS, and electrotransferred into nitrocellulose membranes (BioRad) as previously indicated [44, 50]. After blocking with 5 % BSA, the membranes were incubated overnight at 4 °C with primary antibodies against USF2 (polyclonal, 1:800; Abcam Inc, Cambridge, MA, USA), SF-1 (polyclonal, 1:800; ABR Affinity BioReagents, Golden, CO., USA), P450Arom (monoclonal; 1:600; Serotec, Oxford, UK), TFIIB (monoclonal, 1:500; BD Biosciences, MD, USA), or GAPDH (polyclonal; 1:5000; Abcam). The images were captured with Discovery10gD (Ultralum, Claremont, CA, USA) using UltraQuant 6.0.0.344 software, analyzed with CarestreamMI5.0.6.20 software (Carestream Health, Inc., Rochester, NY, USA). The results were normalized with GAPDH or TFIIB analysis for cytosolic or nuclear extracts, respectively. The assay was performed using LightShift Chemilu-minescent EMSA kit (Thermo Scientific, Rockford, IL, USA). Briefly, 5 μg nuclear proteins obtained as described above were incubated during 20 min at room tempERαture in a reaction mix which included 20 fmol biotin end-labeled oligonucleotides that represented the SF-1 gene promoter containing the E-box (Integrated DNA Technologies, Inc., Coralville, IO, USA) following the manufacturer's indications and as described Utsunomiya et al. For supershift study, nuclear proteins were previously incubated with 1 μg USF2 antibody (Abcam) during 2 h at 4 °C. The samples were resolved in non denaturing 4 % polyacrylamide gel, electrotransferred to biodyne-B membrane (Pall Corporation, Port Washington, NY, USA), which was UV-light crosslinked (UVP HL-2000 HybriLinker, Cambridge, UK), blocked and the label detected following the manufacturer's indications (Thermos). The images were captured with Discovery10gD using UltraQuant 6.0.0.344 software. Results are expressed as mean ± SEM. Kolmogorov-Smirnov test was used to evaluate normal distribution. When non-parametric distribution was present Mann-Whitney or Kruskal-Wallis tests were used, followed by a Dunn test. Means were expressed as percent of increase. Analysis of covariance (ANCOVA) was employed to test statistical intERαction with co-variables like age and phases of the menstrual cycle. USF2: upstream stimulatory factor; SF-1: steroid factor-1; GPER1: G-coupled protein estrogen receptor 1; P450Arom: aromatase enzyme; PPT: 4,4'4"-(4-Pro-pyl-[lH]-pyrazole-l,3,5-tnyl)fr/sphenol; DPN: 2.3-bis(4-Hydroxyphenyl)-propionitrile; ICI 182,780: 7a,17p-[9[4,4,5,5,5-Pentafluoropentyl]sulfinyl]nonyl] estra-1,3,5(10)-triene-3,17-diol; G1: 1 -(4-(6-Bromobenzo[1,3]dioxol-5-yl)-3a,4,5,9b-tetrahydro-3H-cyclopenta[c]quinolin-8-yl)-ethanone; E2: estradiol; PGE2: prostaglandin E2; ER: estrogen receptor. JC participated in experimental protocols and drafted the manuscript. GA carried out cell cultures and EMSA/SS studies and in the analysis of data. PI and PH carried out cell cultures and immunoblots studies and the analysis of data. RG-R diagnosed the endometriosis during surgery, participated in the intERβretation of data and helped reviewing the manuscript critically. HS diagnosed the endometriosis during surgery and participated in the intERβretation of data. MAB participated in the intERβretation of data, helped to draft the article and reviewed the manuscript critically. AF carried out the statistical analysis and helped in the intERβretation of data and reviewing the manuscript critically. MCJ conceived and design the study as principal investigator; participated in the analysis and intERβretation of data and drafting the manuscript. All authors read and approved the final manuscript. The authors are grateful to the women who donated tissue, as this study would not have been possible without their generous contributions. This work was supported by FONDECYT#1120074, Santiago, Chile.